Releasing your calfs using this techniques (MET) I find much more specific than using rollers or a ball on your calfs, please have a go and share if you like it if you have found it beneficial. Tight calfs can lead to shin splints, achilles problems and plantar fasciitis. It's imperative for the triathlete/ runner that the calf is kept healthy, supple and free from pain. 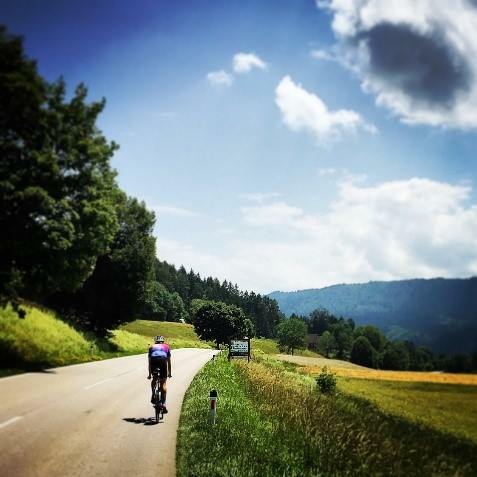 This article about Ironman bike training is designed to take you through the difference in ‘force’ and ‘power’ work in cycling, giving you the knowledge to manage and optimise your training load and ultimately improve your racing. Almost as soon as I had crossed the line at Kona last year then I knew my goal for Austria this year was sub-9. 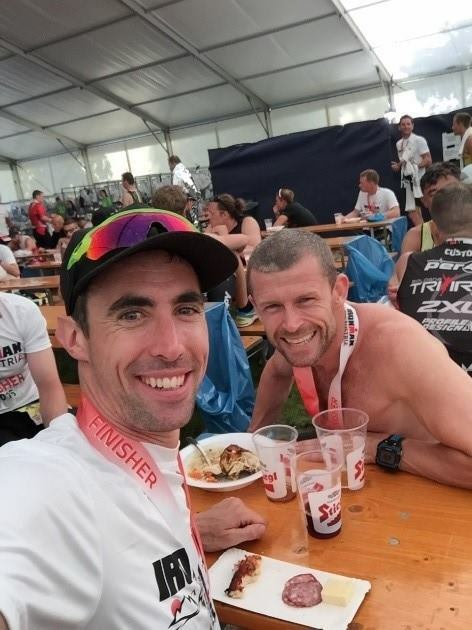 I’ve got some friends – freaks - for whom this is a walk in the park and many - let’s call them ‘normal’ people - for whom it’s ridiculous, which it clearly is given how few people achieve it and how stupid long distance triathlon is. 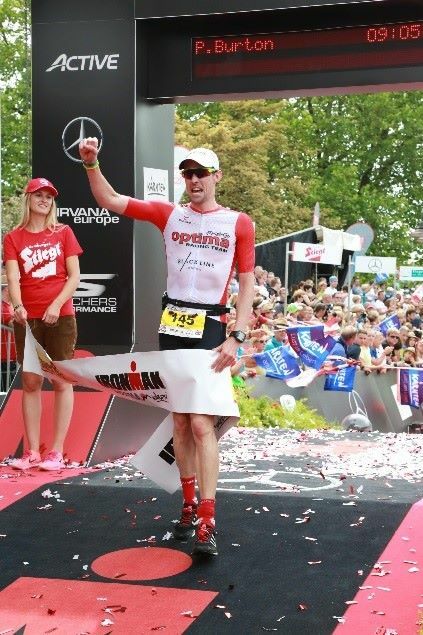 But for me after a 9:34 on a slow day at Kona it felt pitched just right – hopefully achievable and certainly scary - so I’d stuck it up on my fridge in magnetic Scrabble letters in October 2015. Saying ‘yeah, I can see me running a 3:15 off a 4:45 bike and 54 minute swim’ is one thing – but I’ve experienced the hell hole of the second half of an Ironman marathon enough times to know that the reality is normally quite another. But then I still love training and the balance it gives other parts of my life and I’ve continued to improve this year after a long winter build under James’ guidance (and getting duffed up by the Optima juniors in the pool). Whilst it’s a big goal, it just felt like incremental improvement. So why the heck not? Winter was great, and the first two months of my three-month build was even better before a couple of wobbles in the final month (sorry to the cleaning staff at Stockwell tube station) led to an amusing/stressful hokey-cokey decision as to whether to crack on with Austria or regroup for a race a few weeks later. I eventually chose to race and am sat here now I’m delighted that I did. I’ve avoided Austria in the past as it’s really not the place to qualify for Kona, but having scratched that itch last year I chose Austria this year given its legendary reputation. Within 10 seconds of seeing the bright turquoise waters of Wörthersee at Klagenfurt on Wednesday I knew why – it’s stunning. And then Nico and I recce’d the bike course on Thursday and I was sold for a second time. God is clearly a fan of Ironman and he designed his own playground in Southern Austria. 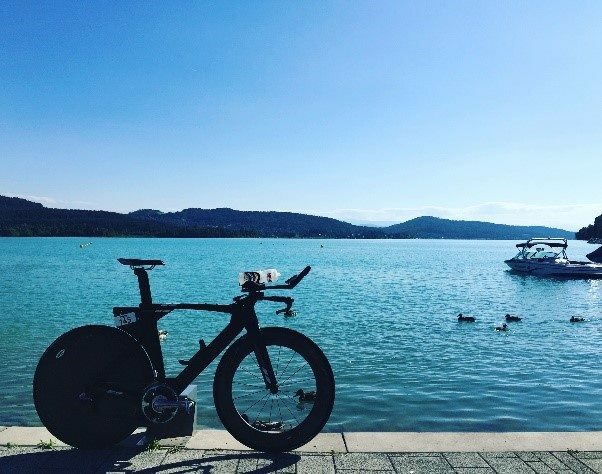 I loved that it was no drag strip course – rolling throughout with a couple of punchy climbs on the loops away from the lake with long, fast descents afterwards, including a 20k rocket back down into Klagenfurt at the end of each lap. Right up my street. It’s a fast course partly because of this profile but also because it’s way short at 176k (shhh, don’t tell anyone). I’m really not a fan of the rolling swim starts Ironman have introduced this year. Firstly, it means you’ve no idea if someone by your side in the race is actually ahead or behind you. Secondly, as a strong swimmer and someone who trains for and relishes the chaos of 3,000 people aiming for the same buoy it feels unfair to remove one of the biggest fear factors of racing. If you want easy, take up Zumba. But it is what it is, and rather than try to second guess whether it would be faster to start further back and work through the field on the swim and bike, I chose to go on the front row with Nico and Tony Cullen (who was also aiming for a sub-9 and finished 1 minute behind me at South Africa last year) to get out front and stay out front all day. Which for four and a half hours is what happened. I felt strong and hit the first half of the swim hard, jumping on feet where I could and loving the final 1km down the narrow canal. Seeing I’d swum 55:50 was a bit disappointing but you never know how long swim courses are. I knew I’d swum well, very few people were around and I could hear Paul Kaye on the mic saying that ‘here are your first age groupers’. Job done. Out on the road I was amongst the first on the course as it was mainly pros around me (they started 10 mins before us). I say ‘pros’ but if this really is their profession I might suggest they get a new one – especially given most of them were trying to check the rear stitching pattern on the shorts of the guys around them. A couple of age groupers came past, including Tony at about 75k on the main descent at a pace I didn’t quite fancy (60k later than he passed me at South Africa last year, so I was pleased to hold him off for so long – he really does know how to ride a push bike) and was enjoying my solo ride. Paul Kaye shouted that I was about 10th age grouper at halfway and at 230-235w I was bang on target power, right on 37kmh / 4:45 pace and most importantly everything felt easy enough. [Warning… Beginning of a rant]. Then things changed a bit, and my ability to dictate my own race went out the window. A pack I saw behind me at the 90k turnaround caught me at 116k. 24 people big, maximum gap about 4m. The only legal place in that rabble was 12m off the back or off the front. Three times I overtook them all and went off the front only to be chased back and swarmed. So I retired to 12m off the back and accepted that in the final hour of the ride my pace would be set for me, other than a petulant attack alongside a Dutch chap in the final 15 minutes to get a small gap at T2. I don’t think this situation impacted my race time – but these guys (and girl) were cheating, saving their legs and at least 10 of them hopped off and ran sub-3 hour marathons into Kona slots, podiums and prize money. With everyone’s national flag on their race number, it’s safe to say those it was the only time since Friday I’ve been pleased about Brexit – Austria and Spain being the countries I’d most like to extradite Nigel Farage to. I didn’t see a single referee motorbike. Not one. Given that group was about 25th to 50th overall at that point, including male and female pros and most of the fast age groupers other than about 10 up the road, it’s a total farce. [Rant over]. I hit T2 after a bike of 4:49 and left to see 5hr 51 race time on the clock. My pre-race sub-9 plan was a 3:15 marathon off a 4:45 bike. Given I’d lost a few minutes to the plan, that 3:15 would be a 9:06 finish time, which would be a 24 minute PB. But it wasn’t what I was there for. Decision time… except there wasn’t one really. I have a pet hate for motivational quotes that get pasted all over social media, with triathletes being particularly guilty parties. 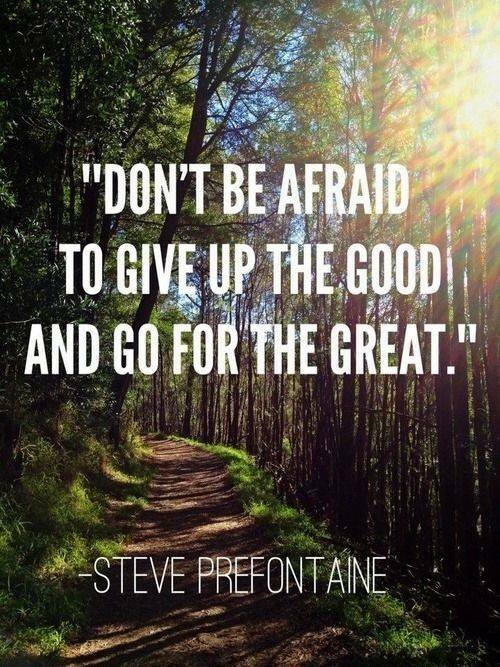 However, there is a caveat for Steve Prefontaine quotes. They’re allowed and should be actively promoted. The night before the race I stuck a particular Pre quote up on Facebook: ‘Don’t be afraid to give up the good and go for the great. I did this for just this situation – having stuck that rubbish up on Facebook I had to roll the dice should the situation arise and deal with the consequences. Whilst I hope this isn’t the case, I may never be coming out of T2 for the opportunity of a sub-9 again. For the second time in the race, whether I liked it or not, my pace was being set for me. 3:09 marathon for a sub-9. With a previous Ironman marathon PB of 3:27 what could possibly go wrong? Well – we all know an awful lot could go wrong from here. But hey ho. On the positive side of things, my legs felt great running through transition, it was still raining so taking the edge off the heat, and I knew the course was 400m short, so it was ‘just’ 4:30km pace required. And I was angry – which isn’t unhelpful. Despite needing a faster than expected marathon, I was still telling myself to hold back at the start. But despite this I ran the first 5km in 21:30, or bang on 3hr marathon pace. Hmm. This is either my best day ever and I’ve just turned into Mirinda Carfrae (who was just up the road – pretty cool), or I’m running headfirst into problems later. As ever reality struck and the early pace slowed – but only to 4:30-4:35 pace. And importantly I was hungry and working through my gels ahead of plan. Needing, wanting and being able to process the calories was a great sign – I’ve never actually had that before. Hang about Pabs – this really might be on. The only downer was seeing Nico (definitely not in race kit) cheering me on with Luzelle outside our apartment on the run course at 3km. I processed that he shouldn’t be there, but couldn’t muster up the question as to why he was. On the way back into town at 10km he told me he’d felt way below par early in the race and decided to stop – been there and it’s a very wise decision. Such a shame as he was in the best shape I’ve ever seen him. Ironman Wales watch out. Two things kept me going in the final 10km. Firstly it was the oldest of my Weak Point Plans – bullying and abusing myself. ‘Any **** can run 10k’, and then ‘any **** can run 5k’ and so on to the end. It works for me. The second was knowing that at the 17k turnaround I had been only 4 minutes behind Tony, who I thought was my competition for first Brit. At South Africa I had caught him on the run with 2km to go and now I was going hunting. As I got closer and closer to the 36km turnaround without seeing him ahead, past the point we’d crossed on lap one, the more excited I got… until I reached the turnaround without having seen him. Was he way ahead? Had I passed him? Had he DNF’d? I had no idea, but the chase had got me running back in the 4:50s and then the 4:40s and now with 5km to go it was time to empty the fumes in the tank and make up places, including a final one in the finish chute. It was a shame to miss Paul Kaye on the line following a failed red carpet dance move ruptured his cruciate ligament (‘hop, hop, hop’ as they say in Austria, PK) – but in truth I was tunnel-visioned, had little clue what was going on and broke the tape at 9:05:40 and a 3:14:51 marathon. Scores on the doors: 45th overall out of 2,900, 43rd male, 30th age grouper, 13th in M35 (megalolz) and 2nd Brit to Tony’s stunning 8:57. And really pleasingly a 1:40 second half of the marathon despite having gone out hard and rolled the dice, and a 25 minute Ironman PB. I went for the great, it didn’t quite stick, but I have no regrets and am delighted with every part of my performance as I couldn’t have got myself to the finish line quicker. The 4 Kona slots in my age group went down to 7th, in a rather rapid 8:55. Hats off to those guys all running sub-3 marathons. Well, the ones that had done it off a proper bike ride, that is. The takeaways are almost entirely positive: - Austria is an incredible course with epic support that everyone should do at some point - I’m undoubtedly capable of sub-9 and I don’t think it’s going to take me the 5 attempts that qualifying for Kona took - I now have proof that the 3 to 4 months of consistent training leading into a race are more important than any of the final 3 or 4 weeks and that you can handle a mishap or two in those weeks – so I’ll chill out about it more next time it happens - My Ironman run is now as good as my swim and bike - Strength of mind and heart are just as, if not more, important than fitness - Don’t put limits on yourself – you’re almost certainly better than you think - I’m still learning loads and improving – after 9 years in triathlon and now 10 Ironmans - Your coach is almost always right - There’s no way I’m stopping this game yet And one negative: - Assuming you can’t change cultural behaviour, unless Ironman begins to referee Austria properly, don’t go there as a pro or fast age grouper and expect a fair race. Massive thanks as ever to my training buddies at Black Line London and Optima Racing Team, to all my friends in the sport, particularly Charlie, Tim and Sam who helped talk me into racing Austria with confidence in those last couple of weeks and most of all to James who has helped me believe and then achieve things I never thought possible. This race report originally appeared here on www.optimaracingteam.com. British Triathlon are currently making a few changes to try to develop the way our youth and junior athletes race and are selected to race in Europe. One area that has been developed in the gateway events, this gives the best young athletes in the country a chance to show where they are and if good enough, to then race in Europe. Llanelli in Wales was the first of super series races in 2016 and Hollie Hindley has given her thoughts on her race. For me this was my first big triathlon of the season and I was excited to see how I could perform. The event was in (sunny for once) Wales where I had competed the previous year so I knew what to expect from the course. I had just received a new wetsuit from Zone 3 and a new tri-suit from Kiwami so I was looking forward to testing out the new kit. This coupled with the fact that I had recently been having a good few weeks in training and racing I was enthusiastic and full of nervous energy. The swim course had changed slightly with the addition of a beach start and consisted of 2 laps where you had to come out after the first lap much like the set up seen in ITU races which added to the excitement. Anticipating a better swim than usual, as I had been swimming well in the week and I hoped I had improved from last season, I wasn't too happy with my swim coming out around mid pack. I could see I was around the normal swimmers I come out with so I would have liked to come out a bit further ahead. This was not the case for my teammate Archie as he led the swim the whole way and came out with a 4 second lead which was a massive improvement to his 33rd out the water last year! Despite the swim I was in a focused mindset so I put it to the back of my head, a slick transition in my new wetsuit and I knew I had to have a strong bike to catch some girls up the road. Almost immediately a group of about 3 of us formed, we worked together for a while and dropped a few girls from the swim. Throughout the bike we caught lots of riders to form a group of about 12 by lap 4, with one more lap to go. The course was quite technical with 3 dead turns per lap, which I made sure I positioned myself at the front of the group for which worked to my advantage, as the corners were fairly dodgy in the pack. I felt strong on the bike, felt I had rode well and by the end of the bike there were just 6 girls up the road, which put me in a good position for the run. Not really knowing what to expect from the run I went off at a steady pace out of transition and a few girls came past me. However once I had found a nice rhythm I was able to pass them again. Looking back now I don’t feel I truly pushed myself out of my comfort zone on the run so this is something I know I need to work on in my next races. I was gradually gaining on one runner who I managed to pass about 100m before the end. I broke away slightly but seemed to slow down a bit so she managed to stay on my heels which led to me being pipped to the finish line in a sprint finish. I came home in 8th place, which secured me a place in Kitzbuhel Junior European Cup! Overall I was happy with my performance and enjoyed the day racing and supporting many of my teammates from Optima Racing Team and the London Academy who all finished in very respectable positions. Greg-5th, Reef-7th, Zak-10th, Abel-18th, Michael-22nd. Do you like being injured? Do you look after the little things as well as you could? Massage, nutrition, sleep, relaxation, balanced lifestyle etc? One of the key areas outside of training & sleeping to enhanced performance for me is something called ‘Pre-Hab’. Pre-Hab (Pre Habilitation or doing things to prevent injury) is often low down the list of priorities for most people trying to balance training with the rest of their lives. This is normal; we have jobs, families, and lives and are simultaneously trying to get better at three disciplines (and transitions). However, as a coach one of the most difficult scenarios I come across is the athlete struggling mentally due to long-term and sometimes short-term injuries. One of the biggest problem areas for triathletes is the lower limb; calves, shins, Achilles and feet. Why? Because our lower limbs are the only weight bearing area we have in triathlon (ignoring saddle sores for Ironman athletes!). A 75kg athlete will have 13,500kg (180 steps per min x 75kg) coming down through their legs every minute, so if it takes them 40mins to run 10km that’s 540,000kg going through the lower limbs. The numbers get significantly bigger over the Ironman marathon, of course. Some of the body’s natural counters to this force coming down through your limbs are the fascia, muscle, tendons and ligaments throughout the body. These amazing structures provide elasticity to our running and will generate nearly half the energy required to provide your next foot strike. This is called the Stretch Shortening Cycle (SSC) and you will see this in action with most elite runners/ triathletes. One of the other key training principals for lowering injury rates is the correct progression and overload used throughout the year. For example if you are new to running and you chose to go out and run every day for the first month due to your new found love of running, it’s highly likely you will get injured. At the other end of the spectrum, if you are an elite athlete and you decide to take your running from 100kms per week up to 130kms per week without progressing slowly with around 10% increments per week, again guess what? The type of running surface can also make a massive difference to the lower limb injury rate of athletes. I don’t know how many runners I have spoken to who swear by the cross-country season ‘strengthening’ their running for the summer. I agree with this, however not only does it strengthen them, it also enhances their proprioception (your sense of where you are in the world) and balance as they struggle in the mud, up and down hills and through wood/ forests etc. Importantly keeping them off hard running tracks, roads and paths and on softer fields and grass areas. The type of training shoe can also increase your risk of injury not only through turning an ankle if you are wearing thick/ cushioned trainers (clodhoppers! ), but this type of training shoe also lowers your feeling for the ground and reduces your proprioception. If you run well, some more natural shoes or light racing flats will enhance your feel for the ground and improve your running. Importantly, they are not overly cushioned so don’t allow you to slam your heel into the ground when you run. Heel striking sends masses of force through your bones, not through the ligament, tendons, fascia and muscles as it naturally should. Weak signals are things like that tight calf you had the other day after your run, but you didn’t think it was bad enough to stop and it felt ok the next day so you didn’t get it treated… sound familiar? Muscle Energy Techniques describes a broad class of manual therapy techniques directed at improving musculoskeletal function or joint function, and improving pain. These are simple techniques that can be applied by a therapist/ physio or can be done as self treatment or by a coach/ parent. Foam rollers are a great addition to your pre-hab routine, but in my opinion the effect is not as specific as using the MET’s especially on the calf area. Moreover, I feel very uneasy when I see athletes rolling up and down a muscle because we know that veins have valves to stop back flow of blood and this rolling back and forth could cause damage to the valve. It was always my routine years ago; back from a run, spend 20mins stretching and not just regular stretching but ‘developmental’ stretching i.e. taking the muscle group to its fullest range and holding the stretch for 30 seconds+. This form of stretching can take functionality/ elasticity away from the muscles. Therefore if you run again the next day or more importantly if you do static stretching pre-event/ workout this could lead to muscle damage or injury as you start to run. I am not saying DON’T do stretching but it needs to be strategically placed into your training week and 100% doing more ballistic movements pre event/ workout will help lower your risk of injury. I have been working with flushing since the early 2000’s and there are two key benefits to flushing. It gently puts the muscle fibers under tension for four to six seconds around three times, to ensure they are elongated and re-aligned (muscle soreness arising from micro tears). Putting the circulatory system, for that particular muscle group, say hamstrings, through vasoconstriction/ vasodilation. The thinking behind this is to increase the blood flow into that specific muscle group, thus increasing healing properties (new blood). Importantly flushing is all done while walking back to your car/ home after a hard session and so you are never static/ still getting cold in winter or reducing your time to post-event fuelling. I’ve been consistently helping athletes qualify for Kona since 2002 and have been in awe of the Big Island since coming into triathlon in the 90’s. I wanted to share my Ironman South Africa race report with you from a coach's perspective. This is my second year of doing Ironman South Africa and I think this was maybe my 11th Ironman altogether. Only once have I ever set myself a target in an Ironman and that was in 2006 at Ironman Austria where I wanted to go under 10 hours. I remember getting off the bike feeling a whole world of pressure (and thinking how the hell do the pros race this distance?!) and this weakness putting me in a bit of a wobble on the run. I did get my head together and eventually came home in 9.59.26… I know!!! As a coach I have never had the inclination to totally dedicate myself to the selfish training required to go fast at Ironman. I am far too passionate about the athletes I work with improving their performance. However, South Africa sits at a good time of year for me as a coach. We have just come out of winter training, we have done some great bike work on training camp and I can squeeze in my key run sessions without disrupting what I need to do as a coach. I also want to make sure the structure of the training plans I write for Ironman athletes are sound and the progression and overload allow them to hit optimum performance in their race. Even from last year to this year I made some significant changes to the bike workouts that have improved the overall Ironman training plan structure. Great few days pre race in South Africa, some of the friendliest people I have come across in the world. Feeling great had a couple of massages on race week for a tight neck (after a battle with a few waves in the ocean! ), but this seemed to loosen one thing and tighten another. The day before the race I woke up and literally could not run, the pain in my back was so severe (I had a vertebrae out around my thoracic spine). After about an hour of gentle movement/stretching it seemed to pop back in and I could do my pre event warm ups… phew!!! Swim: I’m not a fan of rolling starts. It’s not triathlon and it’s not Ironman (I think ITU have a lot of work to do here for elite racing but not for age groupers). Mentally and physically dealing with that pressure and hard start is part of the race, especially for those hoping to qualify for Kona. Possibly think about setting off age-group waves so you are always in a race. To be honest I got a little disorientated and maybe dropped about 4–5mins… but felt strong and took a deep breath and looked forward to the picnic to come. Bike: I know there are lots of schools of thought out there but to me a power meter is a no-brainer in Ironman. It baffles me why people ride up inclines at 300–500w and think they can run off that. Every hill I came to I had women, big men and whomever else coming past me like I was standing still. I kept my power about 15–30w higher than I wanted to on the flat (and 100% no lactate build up) but these little speedies flew past. Even paced with no/limited power spikes is the only way to ride an Ironman bike. Ironman biking to me is about dialing into the numbers (220w for me), with a smooth pedal stroke (80 rpm for me) and then having a picnic every 20mins (shot block, carb drink and water) and enjoying the beautiful scenery that South Africa affords you. For sure on the final lap the old ‘nether regions’ are a little distressed and the legs are tried, but again the power meter allows you confidence that you are in the right place. 6th in AG off the bike. Running felt good off the bike (and a flipping relief to take pressure off down there! ), however a couple of km’s down the road a weak point hit and I kicked in my first weak point plan (WPP)… counting and holding best form. I could feel I had lost rhythm and was not moving very well. Now these moments for most people can be quite traumatic. In my job coaching people we talk through these moments all the time, whether young children taking their first steps into the endurance world or Olympians fighting to stay in contact at the pointy end of our sport. They know my feeling on the mental side and to me its 80% of what we do. So during my weak points, if I capitulate, it’s like a barrister losing their first big case in the high court… when they really should win, no pressure coach! The reason they are called weak points is because you don’t feel strong, you are not frequenting the fight side of the cognitive fight & flight response… you want to step out of the arena, you want to pull the blanket over your shoulders and turn over for the nightmare to end. I walk all aid stations and make the runs between as rhythmical and economical as possible. The next aid station I walked, I took on the coke/water, and I picked up the run again still no rhythm, still no fight, still applying my WPP. This time I’m also tapping into my 2nd WPP, the training I have done… 6 x 5k reps, 20 x 800m, 30k tempo… I’m thinking about the young guys in my team - I want them to be able to look at their coach as someone who has suffered like he asks them to suffer and come up with the answers as he asks them to… A few more km’s of suffering… I don’t wear a GPS or look at my watch. I don’t need to be a rocket scientist to know I’m running slower than I want to… the job is now 100% mental. I dropped from 6th in AG to maybe 16 -18th. In South Africa, the crowds start to pitch their tents on the roadside a couple of days before. They have their braai’s going, beers in hand, but what’s quite weird is they seem to get the sport… After about 8km and out the other side of an aid station, I found some reaction when I asked my legs to lift the pace, the supporters seemed to get this and they encouraged it… It was not easy, but I seemed to be finding a little rhythm again. Entering ‘no man's land’ (the middle of an event or mid way on a run) I used my 3rd WPP, by looking around and appreciating all the different types of people that do this sport, big, small, fat, thin, black, white blah blah… all suffering to some degree or another and getting energy form our united suffering. If I catch an eye of a fellow athlete, a wry smile or look to say ‘come on, we can do this’ or a quick chat (which always gives me a massive boost) before they drop me or the other way round. The one thing I missed in this event is finding another runner with the same rhythm as me to run with, I find this is always a massive benefit. The final few laps I was feeling stronger and stronger, I had come out of the bad patch, I had battled the demons and now I need to collect on a few lost km’s earlier in the run. I’m still walking the aid stations; even with a few km’s to go the wheels can come off. But I felt strong, rhythmical and tapping into good form. It transpires that I was in about 12th going into the final lap of the run but the guys around me were all just within a few minutes of each other. As I crossed the line I was 6th in AG, however due to the rolling start another athlete came in a few mins later that moved me down to 7th in the age group. As I’m now in the 45–49 age category, I knew we would have about 10 slots as one of the biggest age groups so was almost certainly heading to Kona. Nevertheless after seeing the Facebook messages from the guys in the team, I could see I had been very close to messing this up. Phew… Kona baby!!! 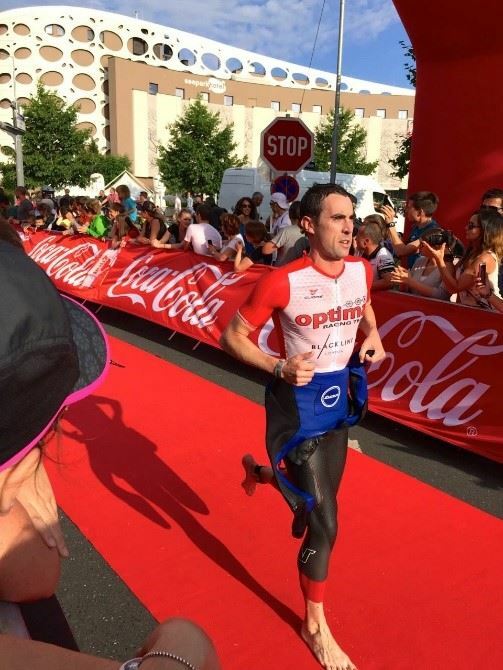 There is a little apprehension though, as there is the small matter of preparing an athlete for the Rio Olympics when I would normally be kicking off my Ironman preparation – but we’ll worry about that later! For now, job done. Aloha!